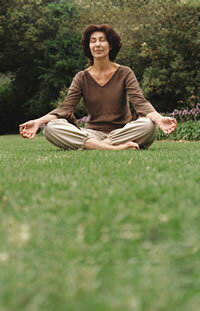 It helps reduce stress and anxiety, which can lower heart rate and blood pressure while reducing harmful hormones. There's more to heart attack and stroke prevention than medications, exercise, and diet. The latest research confirms that people who practice meditation are significantly less likely to have a heart attack or stroke or die within five years. "Meditation can be a useful part of cardiovascular risk reduction," says cardiologist Dr. Deepak Bhatt, a professor at Harvard Medical School. "I do recommend it, along with diet and exercise. It can also help decrease the sense of stress and anxiety." How does meditation affect you physiologically? "It appears to produce changes in brain activity. It also can lower your heart rate, blood pressure, breathing rate, oxygen consumption, adrenaline levels, and levels of cortisol, a hormone released in response to stress," says Dr. Bhatt. There are many types of meditation that can result in physiological benefits, such as guided meditation, which uses mental images to help you relax; Transcendental Meditation, which uses a repeated sound or phrase to help you empty your mind; and mindfulness meditation, which focuses on the present moment and helps you to accept it without judgment. To get in on the benefits, take the advice of Harvard Medical School professor Dr. Herbert Benson, a world-renowned expert in mind-body medicine. "Getting started is easy. You can learn in one minute. But you'll have to do it for at least 10 minutes a day to get the physiological effects," he says. 1. Sit quietly and close your eyes. Breathe slowly. 2. Relax all of your muscles, starting with your feet, legs, and thighs. Shrug your shoulders, roll your neck to the left and right. 3. On each "out" breath, say the word "peace." 4. When thoughts come to mind, decide to come back to them later, and repeat the word "peace." 5. Continue the exercise for at least 10 minutes. Repeat daily. Can deep, slow breathing lower blood pressure?